The great thing about woggles, apart obviously from their name, is that they tend to be available in great numbers at most health and fitness clubs, in part because they are utilised by swimming coaches as a fun way to help young children become accustomed to the water and learn the fundamentals of swimming. Let’s start in waist-high water with some woggle squeezes that exercise, in turn, the chest and upper-back muscles. For the chest, adopt a stable standing position with each foot in line with the corresponding shoulder, hold the woggle in front of you at head height, then pull down on each end until they meet in the middle, breathing in as you do so. Then exhale slowly as you allow the woggle to return to its starting position. The same principle should be adopted for the back, but this time the woggle should lie across the base of the neck at a right angle. Then simply pull down on either end so that the ends meet in front of your chin. Begin both these exercises with five to 10 repetitions, building slowly as your muscles become more comfortable with the procedure. For the lower body, place the woggle behind your neck and under your upper arms, then lie back, utilising its flotation properties. Now, begin controlled, gentle kicks – right, then left – up to about 10 repetitions. Ensure that you allow the leg to move freely in the water rather than forcing the lower back to do too much work. As you work the legs, keep your abdominals nice and tight. This procedure can be repeated floating on your front, this time with the woggle held out in front by your extended arms. Finally, a challenge for the core muscles of your lower back and abdominals. Head out into deeper water, and sit with the woggle between your legs so that it is supporting your pelvis. Rather than move, this discipline is all about keeping your balance as the gentle swell of the pool water buffers you from one side or the other. Position your arms either side of your body but resist the temptation to use them to aid your balance. This will place more responsibility on your trunk to maintain equilibrium. If all this water work isn’t enough for you, then allow someone to wrap the woggle around your midriff and then pull them along. This will provide some resistance that will give your cardiovascular system plenty to think about. 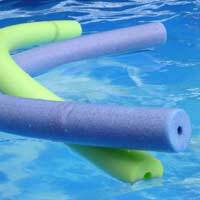 Don’t worry if your woggle work has some pool users giggling behind their hands. Keep focused on your fitness goals and forget any self-conscious thoughts. Regular sessions will bring the desired results and leave you with the broadest smile of all.